Newcastle's Matt Ritchie scores his team's winner against Arsenal. 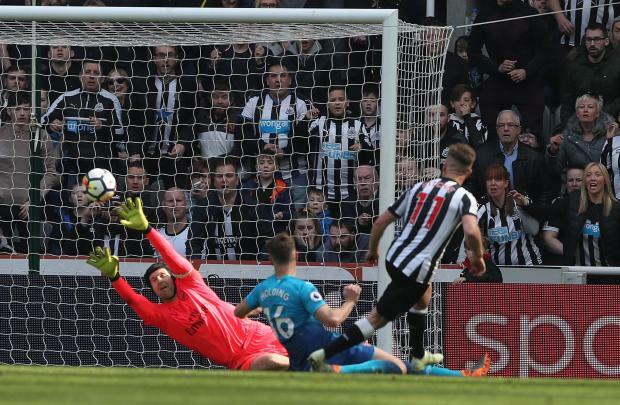 Newcastle United virtually guaranteed their Premier League safety as they came from a goal down to beat Arsenal 2-1 at a spring-like St James' Park on Sunday. Alexandre Lacazette's stretching volley gave Arsenal the lead in the 14th minute but Ayoze Perez clipped in Newcastle's equaliser on the half hour mark. Arsenal pressed hard for an equaliser but Newcastle defended stoutly to claim a fourth successive victory. Newcastle have 41 points in 10th place with sixth-placed Arsenal on 54 -- 13 points behind fourth-placed Tottenham Hotspur. "40 points was the target at the start of the season and hopefully we've done enough now to secure our Premier League status," Ritchie told Sky Sports. "Now we want to keep going and try to finish as high as we can in the table."